Despite speculation that the 2015 general election would be the 'social media election', traditional media, particularly broadcast media, remained more influential than new digital platforms. A majority of the public (62%) reported that TV coverage had been most influential for informing them during the election period, especially televised debates between politicians. Newspapers were next most influential, with the Daily Mail influencing people's opinions most (30%), followed by The Guardian (21%) and The Times (20%). Online, major media outlets—like BBC News, newspaper websites, and Sky News—were most influential. Social media was regarded less influential than radio and conversations with friends and family. Reflecting on analysis carried out during the election campaign period, David Deacon of Loughborough University's Communication Research Centre said there was 'aggressive partisanship [in] many section of the national press' which could be seen especially in the 'Tory press'. 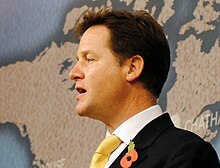 Similarly, Steve Barnett, Professor of Communications at the University of Westminster, said that, while partisanship has always been part of British newspaper campaigning, in this election it was 'more relentless and more one-sided' in favour of the Conservatives and against Labour and the other parties. According to Bart Cammaerts of the Media and Communications Department at the London School of Economics, during the campaign 'almost all newspapers were extremely pro-Conservative and rabidly anti-Labour'. 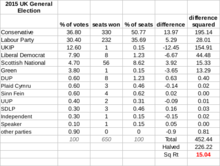 57.5% of the daily newspapers backed the Conservatives, 11.7% Labour, 4.9% UKIP, and 1.4% backed a continuation of the incumbent Conservative-Liberal Democrat coalition government; 66% of Sunday national newspapers backed the Conservatives. Of newspaper front-page lead stories, the Conservatives received 80 positive splashes and 26 negative; Labour received 30 positive against 69 negative. Print media was hostile towards Labour at levels 'not seen since the 1992 General Election', when Neil Kinnock was 'attacked hard and hit below the belt repeatedly'. Roy Greenslade described the newspaper coverage of Labour as 'relentless ridicule'. Of the leader columns in The Sun 95% were anti-Labour. The SNP also received substantial negative press in English newspapers: of the 59 leader columns about the SNP during the election, one was positive. 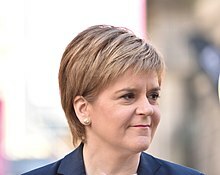 The Daily Mail ran a headline suggesting SNP leader Nicola Sturgeon was 'the most dangerous woman in Britain' and, at other times, called her a 'glamorous power-dressing imperatrix' and said that she 'would make Hillary Clinton look human'. 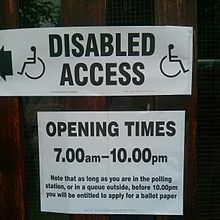 While the Scottish edition of The Sun encouraged people north of the border to vote for the SNP, the English edition encouraged people to vote for the Conservatives in order to "stop the SNP running the country". 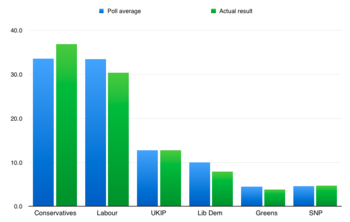 The negative coverage of the SNP increased towards the end of the election campaign. While TV news airtime given to quotations from politicians was more balanced between the two larger parties (Con. : 30.14%; Lab. 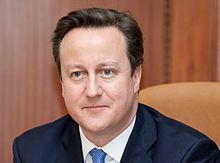 : 27.98%), more column space in newspapers was dedicated to quotes from Conservative politicians (44.45% versus 29.01% for Labour)—according to analysts, the Conservatives 'benefitted from a Tory supporting press in away the other leaders did not'. At times, the Conservatives worked closely with newspapers to co-ordinate their news coverage. For example, The Daily Telegraph printed a letter purportedly sent directly to the paper from 5,000 small business owners; the letter had been organised by the Conservatives and prepared at Conservative Campaign Headquarters.